On Monday, the Court handed down DirectTV v. Imburgia, which now succeeds AT&T Mobility v. Concepcion, 131 S. Ct. 1740 (2011) as the latest substantive decision from the Court on Federal Arbitration Act (FAA) preemption. The case is interesting for a number of reasons, not least of which is that it makes it increasingly clear that the core logic of FAA preemption is one of antidiscrimination. DirecTV held that the California Court of Appeal’s construction of a condition precedent in the parties’ arbitration agreement was preempted by the FAA. Writing for the majority, Justice Breyer clearly believed that the California appellate court had gotten its own state’s law of contract construction wrong. But he conceded—as he had to—that a federal court cannot sit in judgment of a state court decision on state law. So it was not enough simply to say that the decision was irrational and just plain wrong (which it was in my opinion as a contracts professor). There had to be a reason why the decision conflicted with the FAA. Nothing. Well, not exactly nothing--just nothing for me. What I really want for Christmas is for more holiday gift-givers to honor their family, friends and business contacts by making charitable contributions on their behalf instead of buying them material gifts. Members of my family recently exchanged the names of our favorite charities and agreed to make charitable contributions this year, in lieu of our usual Christmas gifts. Now I have started to think about how this could happen on a much larger scale. Societal norms currently favor material gifts over charitable contributions to honor someone. A gift-giver often has no way of knowing whether friends, family, and business contacts would prefer a material gift or a charitable gift in their honor. Also, a gift-giver might be concerned about appearing cheap and selfish if she substitutes a tax deductible donation for a non-deductible material gift. When in doubt, gift-givers make the "safe" gift choice and give material presents. On the gift recipient's side, there typically is no easy, socially acceptable way of communicating to gift-givers a preference for a charitable contribution. This is especially true with respect to gifts for business associates, clients and professionals such as doctors. A little more than two weeks have passed since Priscilla Chan and Mark Zuckerberg announced that they would give away 99% of their Facebook stock, currently valued at $45 billion, during their lives. This distance, albeit short, gives time to reflect back on what the Chan Zuckerberg Initiative is and what it is not. Early coverage, particularly headlines, suggested that Chan and Zuckerberg had made a current donation to charity. Facebook quickly worked to correct this erroneous impression. The Chan Zuckerberg Initiative involves a transfer to Delaware LLC, a limited liability company, not a public charity or private foundation. For tax purposes, the transfer to the LLC is a tax nothing; it has no effect on the couple’s taxes. As Professor Michael Graetz stated Mr. Zuckerberg “has moved money from one of his pockets to another.” Chan and Zuckerberg have given nothing away yet. Professor David Glazier recently filed an amicus brief with the U.S. Court of Appeals for the District of Columbia in the case of Abd al-Rahim Hussein Al Nashiri v. Barack Obama, et. al. Abd al-Rahim Hussein Al Nashiri ("Nashiri") is facing military commission trial at the U.S. Naval Station at Guantánamo Bay for three incidents that transpired in or near Yemen between 2000 and 2002: the attempted bombing of the USS The Sullivans on January 3, 2000; and the completed bombings of the USS Cole and the French tanker M/V Limburg on October 12, 2000 and October 6, 2002, respectively. Read the full brief below. Today, the Supreme Court will hear arguments in yet another racial affirmative action case involving college admissions. It seems perfectly reasonable for non-lawyers to wonder why these types of cases—cases filed by rejected white applicants alleging a college violated the Constitution by considering race—appear before the Supreme Court so regularly. If I did not teach and write about these cases, I would be left to think that racism against white college applicants is rampant. Why else would the U.S. Supreme Court, the highest court in the land, be hearing so many of these cases? Why else, in the case that will be argued today, would the Supreme Court hear the same case twice? Again, if I did not know all of the specific details of the lawsuit, I would presume that the plaintiff in the case, Abigail Fisher, must have been wronged in some way—why else would she find lawyers and subject herself to the national attention (and ridicule over her less-than-stellar grades and SAT score) that she has endured as people across the nation have debated whether she was indeed qualified to attend the University of Texas at Austin when she applied as a high school student for admission back in 2008. What is the impact and frequency of recent hedge fund activism? What developments are taking place at the border between public and private markets and companies? Could companies hire CEOs at lower compensation levels by changing their approach to the hiring process? These are some of the questions being discussed today at the Southern California Business Law Workshop hosted at Loyola Law School. 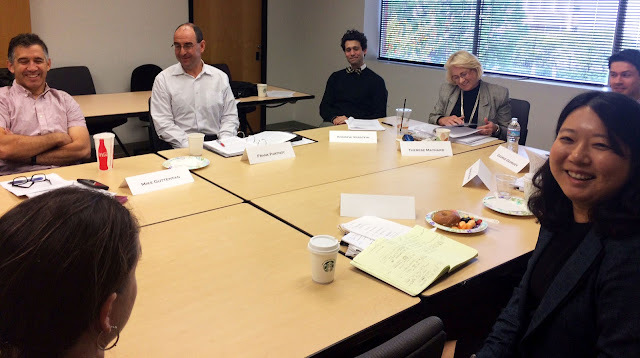 Business law scholars from Loyola, USC, UCLA, Pepperdine, Southwestern, UC Irvine, and University of San Diego have gathered to discuss works in progress at the cutting edge of business law and at intersections with other areas of law. A priest, a rabbi and a minister walk into a bar. They each live in a different state Senate district with 100,000 people in each district. There are 80,000 voters in the priest’s district, 50,000 in the rabbi’s district and 20,000 in the minister’s district. This is not the beginning of a joke, but rather the basis of one of the most important election law cases to hit the U.S. Supreme Court in years. If two candidates run for state Senate in each district, the priest will have to convince 40,001 of his friends to vote for his preferred candidate. The rabbi, by contrast, will only have to sway 25,001 voters. And the minister has the easiest task; he must only persuade 10,001 voters in order for his preferred candidate to win the election. Put another way, in the priest’s district it takes many more voters to elect the candidate of his choice.